Barraclough, D. and J. O'Hara. 1998. Obscuromyia, a remarkable new genus of the endemic Australian tribe Myiotrixini (Diptera: Tachinidae: Tachininae). Invert. Taxon. 12:825-832. Barraclough, D. A. 2005. Rhinophoroides minutus, a new genus and species of rare nocturnal Dufouriini (Diptera: Tachinidae: Dexiinae) from South Africa. Afric. Entomol. 13:380-384. O'Hara, J. E. & Wood, D. M. 2004. Catalogue of the Tachinidae (Diptera) of America north of Mexico. Mem. Entomol. Intern. 18:1-410. Oosterbroek, P. 1998. Tachinidae. In P. Oosterbroek: The families of Diptera of the Malay Archipelago. Brill: Boston. pp. 145-146. Pape, T. 1992. Phylogeny of the Tachinidae family group (Diptera:Calyptratae). Tijdrschr. Entomol. 135:43-86. Stireman, J. O. III, J. E. O'Hara, and ­D. M. Wood. 2006. Tachinidae: evolution, behavior, and ecology. Annual Review of Entomology 51:525-555. Wood, D.M. 1987. 110. 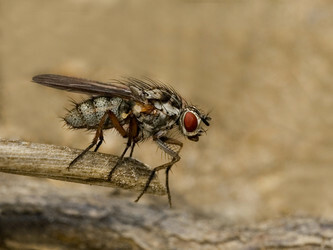 Tachinidae. Manual Nearct. Dipt. 2:1193-1269. Tachinidae Resources. James E. O'Hara, Agriculture and Agri-Food Canada.